We just got in some new homespuns, Harvest Moon by Buggy Barn & a cute whimsical stripe from Timeless Treasures. I have just returned from a trip to Iowa with my husband on business. Along the way I got to check out many quilt shops and some very neat towns. 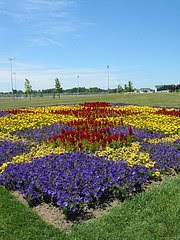 I discovered that Indiana has a Quilt Garden Tours going on right now through October 1, 2009. There are 16 quilt gardens and 16 hand-painted quilt murals along a Heritage Trail Driving Tour. Unfortunately we did not have time to check them out, but I did pick up a flyer on them and have checked out their website. If you are in that area, go see them. If not, you can go to their website or blog and see pictures. They are absolutely beautiful! We also discovered a neat village which was the Bishop Hill Colony in Illinois. The Colony was established in 1846 by the Swedes. There are many of the existing Colony buildings still there to tour. They also have many great shops. One of them that I went to was called The Village Smithy which was a combination antique and quilt shop. I must confess that I bought a number of William Morris prints there and I also found a dish towel with a cute design on which has Wednesday as the day of the week showing it as a sewing day. I had to have it! They also were raffling off a really neat quilt. I hope I win! I just finished my sample of the Once Upon A Christmas Wall Hanging. 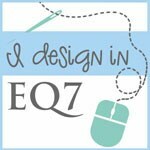 There are earlier posts of the fabric and pattern link. It went together very fast and I did very simple quilting on it, but I like the way it turned out. It will look great over the fireplace this Christmas! Some new samples for the shop are Grandma's Porch, How to Quilt and Beautiful Blooms. How To Quilt from Country Threads. Beautiful Blooms from The Pattern Basket. 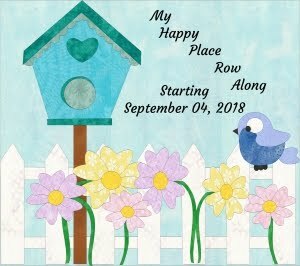 Grandma's Porch by Carol Hopkins Designs. All of these samples were made by Melissa. Great job! I really like Grandma's Porch and I guess you know why! Reproduction fabric of course! My daughter-in-law Zlaty just pieced two Easy Sriped Tablerunners using the pattern by Karen Montgomery from The Quilt Company. They are just beautiful! 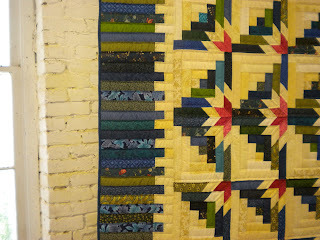 She used the border stripe from The Quilter's Kitchen collection from Elm Creek Quilts Series. I love how they look and am going to try one myself! Zlaty has inspired me so often with the patterns and fabrics that she makes. Thanks for the inspiration, Zlaty! I love them! Here is a closeup of the pattern she used. I just love little quilts. Little quilts are actually doable for me to finish. I like that you can try many different designs and use many different fabrics and be able to complete them and enjoy them in a shorter amount of time. They are great for hanging on the wall, using as a centerpiece on your tables, even decorate on the back of a chair. If you have a daughter or granddaughter, they make great doll quilts. You can also use them for a small quilt for a toddler to use as their lovey! Janie brought in some little quilts to share and I just love them! These first quilts are made from my pattern Starry Nine Patch! I just love them made in reproduction fabrics! 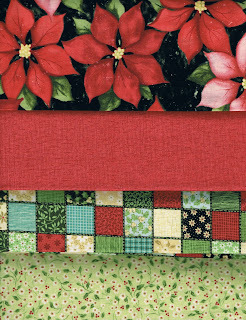 This placemat pattern is Slice 'em & Dice 'em from Willow Creek Quilts. Great job Janie! They are just beautiful! I can't wait to see what you will do next! Wed. was club day and we had some show and tell. I just love seeing what everyone is doing! This is Judy's sampler! It looks great! She did machine piecing and hand applique. this is part of the sampler, but she has the rest of the blocks finished. It takes a lot of time to cut and piece so many squares for the borders, but it is fantastic the way it looks! Beautiful job Judy! Take a hand-painted folk art Santa panel, then add a luscious Christmas poinsettia print, bursting with color and mix in a charming mini-patch print, happy Christmas trees and a whole host of vibrant miniprints and textures. The result is truly magical! 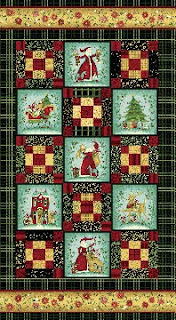 Susan Winget's collection has all the warmth of the Christmas season. 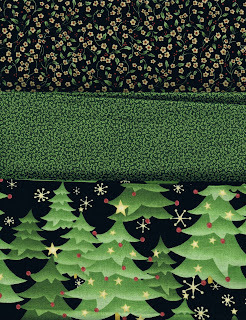 The rich prints of Once Upon a Christmas are perfect for family projects-just add borders to the panel, create stockings or tree skirts and you've created an instant family tradition! In holiday red/green. Here are some detail pictures too! Sorry for the yellowed ones, but I did not have the flash on.